by PokerAnon ~ January 14th, 2011. Filed under: $ 25nl x 6+ tables of FR. Okay, congratulating myself for having played 3 days in a row. Not a lot of memorable hands, save one, but I did finish up $18, which offsets the $17 loss in the previous session. This is the first session in some time where it ended because we lost internet connection. I signed out, then tried to use the browser but couldn’t get anywhere either so I went to the modem and router and reset them. 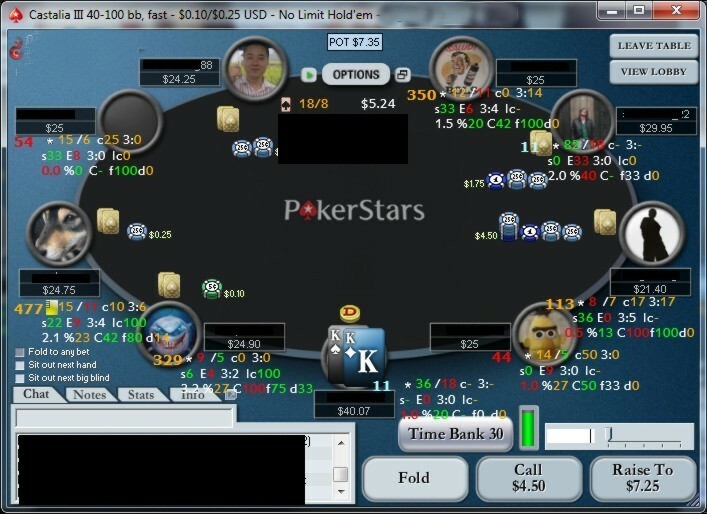 I restarted the PokerStars client and found I was still sitting at all six tables so I closed them and shut the client down. Missed playing one AK that I had seen sitting there, but, oh well. There was one very memorable hand though. I’m in my twelveth hand at this table and I get KK in late position (I have no idea how I got to $40 in twelve hands, though this may be the table where I flatted 98 in the blinds 4-way, flopped A98 and check-raised all in on the bad player who has since rebought). Early position raise from a seemingly bad player that let his stack run out and then reloaded. 3 bet from mid position. Then, a 4 bet from a 8/7 that I have 113 hands of history on. I don’t have really good reads or stats on the first two players, but I do know that the third one is a nit. A cold 4-bet, albeit in position and facing one player who I don’t think is good, but this makes me pretty darn certain that I’m up against AA from the nit, and if not, then possibly from one of the others. I fold my KK. The the other two proceed to get it all in, so now I’m sure I’m facing at least one instance of AA, maybe even the other KK, or one AA and one AK, or maybe one AA and one QQ. As it turns out, I would have been a 40% fav preflop, though I would have lost to the set of Queens. But a nit, 4-betting from middle position in full ring? When I have KK which makes KK and even AK less likely? It just feels like I’m dominated. The only reasoning that I can think of is that he had more hands at the table than I did and knew that the first raise came from a bad player. Maybe he even thinks that the player in front of him is also bad, or that he is trying to isolate the bad player that raised first, so by 4-betting he can re-isolate. Anyway, this is the only time that I can recall folding KK preflop. One other time I put a half stack on AA but got my KK in anyway because he was short and because there were other bad players involved whose money I could win. I ended up sucking out on that one and taking the whole pot with a set or something. So, is this a bad fold? If I have AA I’m shoving every time, but given that mostly I only had information on the 4 bettor, I don’t know.